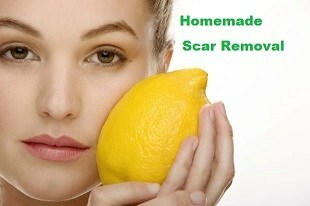 Easy and Natural Homemade Scar Removal Remedies. In my experience, lemon remedy for scars is very effective. But some people were having different reaction, lemon remedy will not work with them. My neighborhoods blaming me on that situation, so I will ask help again to my grandmother, then one thing that she teaches me for that situation. She said, it should treat by the LEMON SCAR REMEDY BOOSTER. I recommend it to my friend, he tried it, and his scars will disappear in just a week. It’s more effective right? Well, if you are the one that lemon remedy alone is not enough to cure scars, then you should try to follow the remedy given below. If all ingredients are ready, then mix it together in a clean bowl, cup, or bottle or wherever you want it to preserve. Apply this remedy every day. Best time to apply is night time before bedtime. Leave it in a whole night, then wash it in the morning of a cool to lukewarm water. That’s it! Usually this remedy will remove your newly scars in just a week depending on the situation of your scars. Every one of us has a different reaction, so just give some patience on treating on it and accept the reward at the end. I hope you enjoyed on this guide about how to make homemade scar removal treatment, and I am happy to hear you in the comments area about your experience of my grandmother lemon scars remedy booster. If you like the remedy you learn here, then shares it to your friends and most of all to the one that you care.